Highlighted below are some tips on what to look for when choosing a best air compressor for nailers. But before we get into that, what about my choice? CFM is important and indicates the air speed the compressor can supply. Additionally, it is typically the most vital number to think about. If a compressor cannot supply a tool with air faster than it is needed, you will have to pause for the compressor to catch up with that tool. All manufacturers test their compressors at 90 psi, which is a regular nail gun setting. Therefore, when you examine CFM numbers, you can be sure you are linking apples to apples. For the best idea on the quantity of air power a compressor can deliver, examine the CFM. Compressors have tanks that range in volume as it relates to what they can hold. A bigger tank accommodates more air and enables you to utilize more air prior to the pressure dropping and the motor kicking on to refill the tank. This could allow you to avoid stopping as the tank refilled by the compressor. Bear in mind that when your project demands huge air volume, a huge tank is no substitute for sufficient CFM. The majority of compressors provide adequate amount of pressure for DIY tasks. As such, the psi is not that much of an issue. However, a higher maximum psi has one real benefit – it makes it possible for a smaller tank to accommodate additional air and perform similarly to a bigger tank. For instance, a 2-gallon tank operating at 150 psi can accommodate the same air as a 3-gallon tank operating at 100 pounds per square inch. This is not just about weight. In essence, weight is not the only factor when trying to figure out if a compressor can be carried around easily. The shape of the compressor is important as well. A small, slender compressor unit is the easiest to carry; the most awkward are the wide ones. Most compressors deliver adequate pressure or psi and volume (CFM) to power trim nailers. However, the same is not true for framing nailers. Many compressors provide adequate pressure for framing nailers, usually 120 psi approximately. Only compressors with ratings of roughly 2 CFM or higher has the capacity to keep up with framing nailers working at moderate speed. The ones with lower CFM ratings call for patience. For example, you will drive in a few nails and then pause for the machine to catch up. Air compressors range in decibels and though the range may not appear to be a huge difference, it definitely is. Unlike other scales you might use to, the decibel scale is different. Moving up 10 decibel doubles the noise level. For example, a machine rated at 70 decibels is two times as loud as one with a 60-decibel rating. An 80-decibel machine is 4 times louder. Therefore, a small decibel reduction goes a far way in making a compressor more pleasant to operate. Among the advantages of a small compressor is its capacity to be taken virtually anywhere. The problem is that a small compressor is likely to become battered. There will be no damage to the tank; however, the outlets and gauges are susceptible unless they are protected. There are machines that go all in and are constructed with a case that totally surrounds it. There are other versions that leave some parts unprotected. Just about every small air compressor is now ‘oil-less.’ This is an indication that you will never have to be concern about changing oil or even checking it. Typically, a small, oil-less air compressor wears out quicker than oil-lubricated versions. However, that is unlikely to be an issue with regular DIY use. 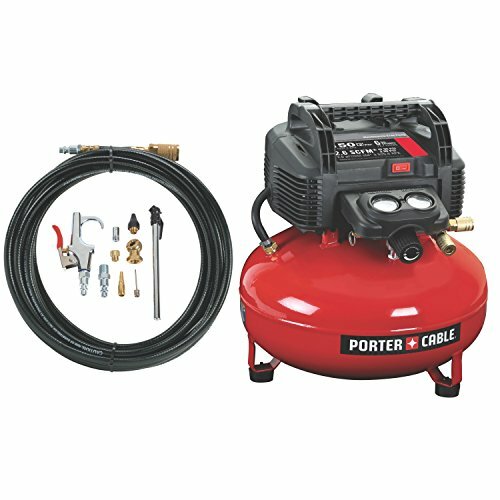 The majority of air compressors equipped with a single outlet designed to connect an air hose. However, there are a few that have two, which allows you to work together with another person. Condensed water in the tank of an air compressor results in pinhole leaks and rusting. For this to be prevented, manufacturers suggest that you regularly drain the tank. All tanks have drains; however, there are two distinct varieties. A ball valve drain that works similar to a faucet is a much better option. To benefit from added value, go for compressors that are available with a set of inflation accessories or a hose. Some may bundled underneath a different model number with a hose and nail gun. These are some of the guidelines on what to look for when choosing a best air compressor for nailers.